Intermetallic « Global Market Insights, Inc. In recent times, it has been observed that most of the leading players in thermal spray coating market have been constantly striving to transform the business vertical by means of bringing forth a plethora of innovative spraying systems. 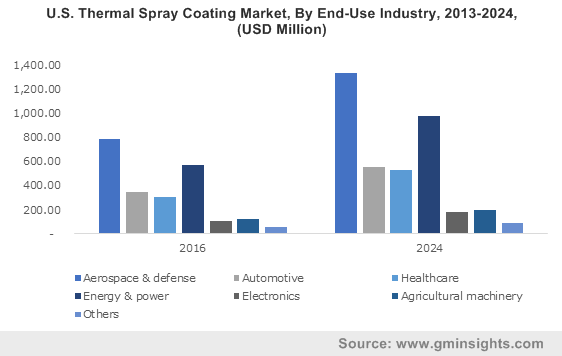 These firms have also been looking forward to developing sustainable spraying solutions considering the adverse effect of conventional coatings material on the environment. In this regard, in 2008, the EPA deployed new air pollution regulation rules, which have been applied for the existing thermal spraying processes that emit Hazardous Air Pollutants (HAP). Prominent HAP elements comprise manganese, lead, chromium, cadmium, and nickel. The EPA has also framed the National Emission Standards for Hazardous Air Pollutants (NESHAP) to implement regulatory compliances over the use of HPA emitting spraying process. In order to comply with such regulatory norms, many shipbuilding and refurbishment companies are continuously adopting sustainable and eco-friendly coating technologies, which would have a massive impact on thermal spray coating industry trends over the years ahead. It is rather overt that myriad thermal spray coating market giants have been investing considerably in facility expansions in order to capture more business space. For instance, a joint venture of a leading player in thermal spray coating market, Praxair Surface Technologies and GE Aviation, PG Technology has recently decided to expand its coating facility plant based in Singapore considering the growing requirement of the product across the enormously intensifying aerospace sector. At this new facility plant, the company plans to double the electron beam physical vapor deposition coating capacity and install other important aviation-related coating processes. The facility is likely to become operational by 2019. PG Technologies’ move has been projected to increase the competitiveness across Singapore thermal spray coating market. Indeed, this investment in the capacity expansion will also help other Singapore based small scale companies to enhance their capabilities. Jet engine manufacturers and companies in aviation sectors are looking forward to implementing next-generation coating technologies in order to enhance the capability of jet engines to withstand high stress and temperatures, which would propel thermal spray coating market outlook. Moreover, the versatility of thermal spraying technology, owing to which it can be used for any type of material including plastic, metal, and ceramic, is one the major benefits that can be credited for its rising preference. In order to maintain the cost-effectiveness and quality of coatings, leading aerospace companies have been signing long-term partnership agreements with pivotal participants in thermal spray coating industry. For instance, a year before, Praxair Surface Technologies, one of the notable thermal spray coating market firms, signed a 10-year contract with the well-known aero engine manufacturer, Rolls Royce. Praxair Surface Technologies’ humongous expertise in coating operations will help Rolls Royce improve its engine efficiency and lifecycle. Thus, pertaining to the surging requirement of spray coatings in the aviation sector, in 2016, aerospace and defense held a revenue of USD 2.5 billion in thermal spray coating industry share. With the increasing adoption rate of thermal spray coating technologies, several contributors in thermal spray coating market are focusing on the development of innovative and advanced coating technologies incorporated with the benefits of less energy consumption, lesser downtime, improved productivity, high quality products, extended shelf life of products, and lower operating costs. Indeed, in the ensuing years, the growing demand for next-generation engines and high-quality components is slated to generate lucrative opportunities for giants in thermal spray coating industry, that would eventually impact the revenue generation of this business space. This entry was posted in Bulk & Specialty Chemicals and tagged Alumina, Aluminum, Ceramics, Chromia, Cold Spray, Combustion Flame, Detonation, Electrical Energy, Fe-Al, High Velocity, Intermetallic, Low Velocity, Material, Metal, Molybdenum, Ni-Al, Ni-Ti, Nickel, Plasma Spraying, Polyester, polyethylene, polymer, Polytetrafluoroethylene, Stainless Steel, Thermal Spray Coating Market, Ti-Al, Titania, Titanium, Tribological Materials, Two-Wire Electric Arc Spraying, Yttria, Zirconia.